The history of St. Bartholomew’s Church remains quite a mystery. 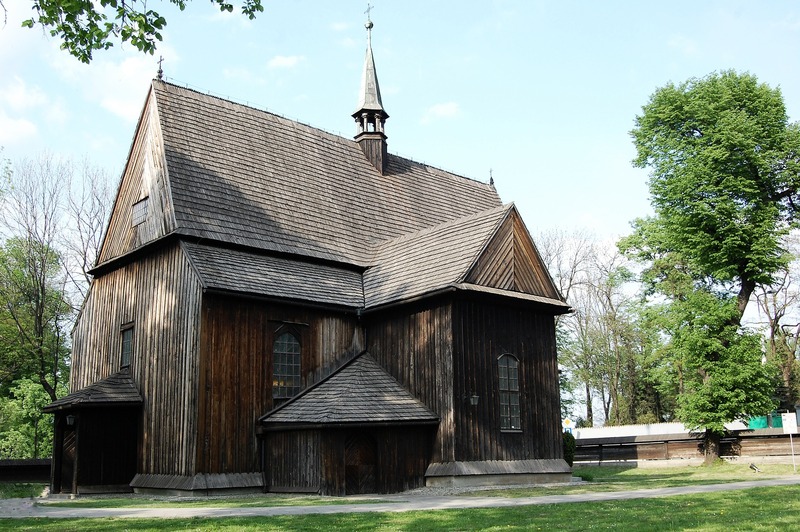 The first mention about St. Bartholomew’s Church comes from the document from 1329, which makes it the oldest wooden church in Poland. 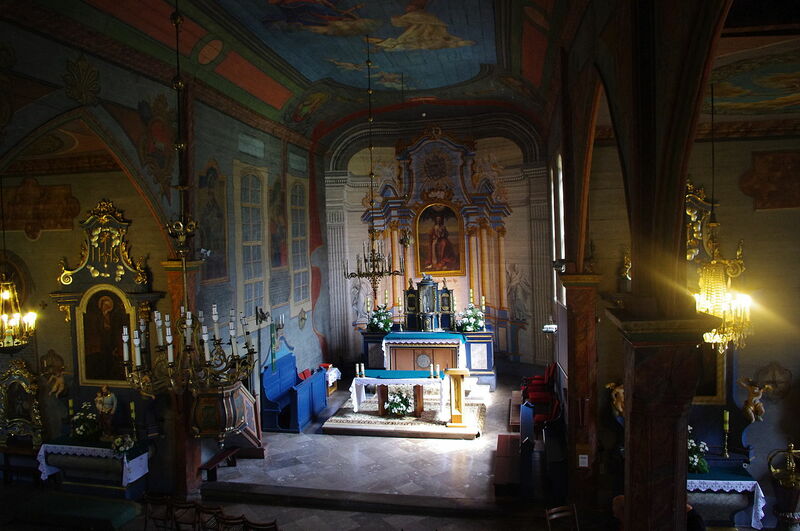 It was built as a parish church for the local community by the Cistercian Order and bishop of Krakow, Iwo Odrowaz. It was his initiative to invite the Order over one hundred years earlier and establish the Cistercian Abbey nearby. The parish church probably burned down in 1466 and as a result, had to be rebuilt almost entirely. During that time, a beautiful inscription was carved in the southern Gothic portal of the church. The church has three aisles and is oriented to the east. Around 1740 a thorough reconstruction and modernisation of the church took place and the church was given the shape of a Latin cross. However, the existing Gothic spatial-structural layout has not been changed. Pointed arched arcades, supported by beveled and profiled columns that divide the interior into the main nave and the aisles were preserved. In 1839 also two vestibules were added. 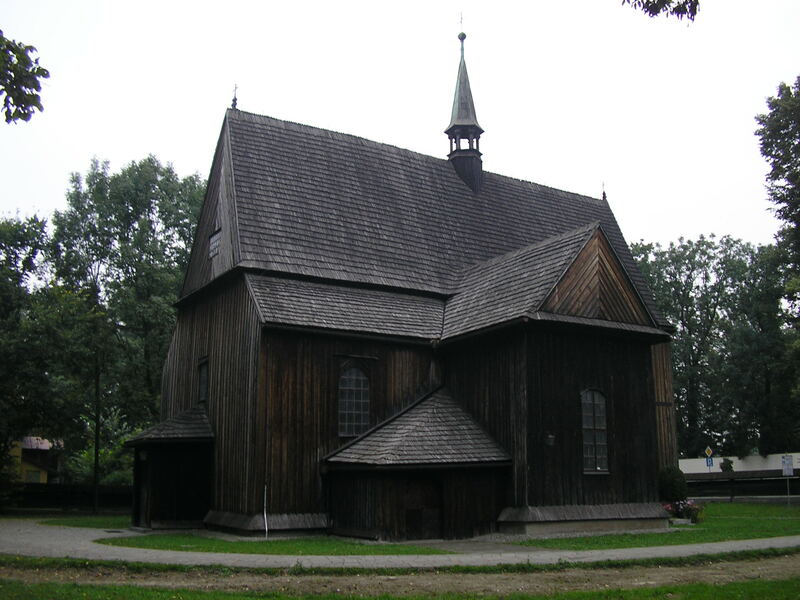 St. Bartholomew’s Church is part of the Wooden Architecture Route, with a length of more than 1500 km, that includes 253 architectural ensembles from Catholic and Eastern Orthodox churches, chapels and belfries to granaries, country cottages and noble mansions, of which eight are listed as UNESCO World Heritage Sites. 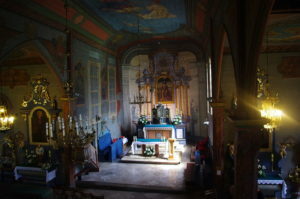 The Church can be visited along with the Cistercian Abbey nearby. Arranging a visit in advance by contacting the Abbey is advised. As part of the Wooden Architecture Route, the Church can be visited on Fridays and Saturdays between 9 a.m. and 6 p.m. (with half-hour break from 1 p.m.). On Sundays there is a mass at 11:30 a.m. and the Church remains open to visitors from noon to 5 p.m.